It’s late February. It’s Vancouver. It snowed briefly this morning. By late afternoon the temperature “warms” to 5C (41F) allowing for the return of our 2007 Yamaha R1 tester to Pacific Yamaha. For eight days the weather’s been oscillating from warmish sunny days to pure cold wet misery. On those latter days riding has been about restraint and control, and that fits, especially given the flurry of contention around Yamaha’s Chip Controlled Throttle (YCC-T) in communities like R1-Forum.com. In conditions like these, throttle control makes the difference between a cold rear Diablo Corsa stepping out on damp gritty roads, or an elegant run of the twisties. Riding now is challenging, confusing, slightly unpredictable and occasionally rewarding… sort of like the 2007 R1. Ah, found it… the lag. 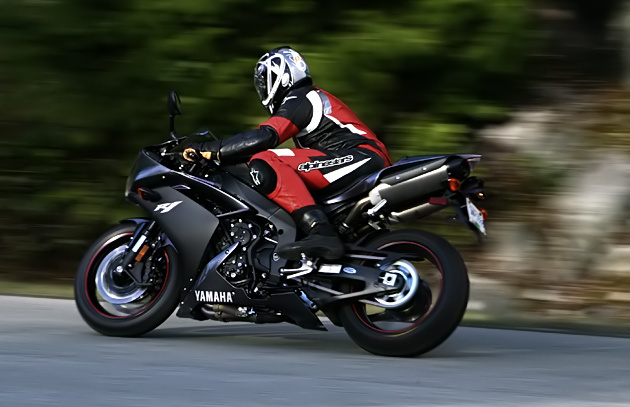 Hold the new 2007 Yamaha R1 at approximately 5,500RPM, in second gear, and loiter along at a completely un-litre bike-like 78kph… then roll on aggressively. The R1 doesn’t respond at first, builds up the engine stretching out elastic, and punches through. Suddenly it seems I have a Bandit 1200 below me, but then as the tach sweeps past 6000RPM the R1 launches as if strapped to a JATO bottle – back to litre bike business as usual. The lag’s duration is a whispered “one-one-thousand” count and you’ll still outpace traffic, but your sure bet of superbike stomp has been made a gamble by ECU dictating a nanny-state Euro-III emissions map. Outside a few hours of this “picking at the scab” diagnostic, the lag only catches me out twice in eight days. The first, I’m hanging behind an elderly Valiant, waiting for an opening in traffic; I pull out to pass and acceleration is startlingly lacking. The second, I’m loitering down an onramp, then pinning the R1 intending to pull ahead of traffic with extreme prejudice. Either time I could have easily ridden around thelag by changing gears. By comparison I’d take this glitch over my ’03 VFR 800’s VTEC “Grand Canyon” flat-spot at 6500-7000RPM, followed by the “Marketing said people should feel it” kick any day – especially the wet ones. On the VFR, the VTEC constantly affects cornering, for thelag there’s an easy solution; ride the R1 like the hedonic, manic-revving litre bike it is and reap the rewards. I can see oncoming truckers in insolated cabs looking on wide-eyed. The twin under-tail exhausts are issuing brutal aural violence, while below me four inline cylinders scream as I inflict a 13,750RPM redline on them. The only other howl approaching the new 16-valve engine’s would likely be a traffic court judge’s. I pull over to the shoulder and take a note, “First gear – 162kph [100mph]; not really a useful piece of information, but it drives home how preposterously tall the gearing is.” What I don’t jot down is how good it feels to finally uncork the R1. On repeated runs of this long straight stretch, I legitimately touch third gear on the R1. Then giddy with speed and smirking in my helmet I ensure that 4th, 5th, and 6th gears are present and accounted for. You’d almost never use the higher ratios in daily riding, other than to reduce the intrusive mirror-blurring vibration the R1 develops past 7000RPM. The R1 pulls strong through the upper rev range, no doubt softening by 12,500, in the same way a baseball bat to the back of the head is “softer” than a brick. A very brief outing on the 2006 R1 has me believing the ’07 R1 is truly stronger in the midrange, complete with improved torque. The technological trickery here is the YCC-I (Yamaha Chip Controlled – Intake), which optimizes intake length for torque development at the low end and then splits the intake trumpets for better top end power (see sidebar). The transition takes a third of a second, an the point at which it occurs varies with throttle usage, but its hardly grounds for upset. Especially given this wizardry results in a 5hp peak output gain bringing horsepower to a claimed 180hp, counteracting a 5kg weight gain over last years bike – more likely the rear wheel is turning away at around 160hp. Still, that spec-sheet racing bragging right hardly matters – what does is in the mid and upper rev ranges the R1’s personality is focused; it’s a snarling, barking, mad litre all the way. 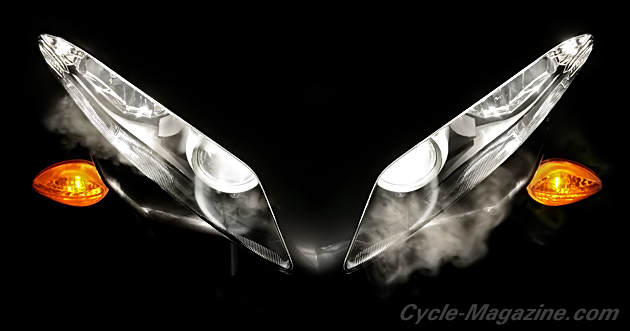 Below 4000rpm an identity crisis creeps in; nail the throttle off the line and the R1 seems completely shocked at green-light drag race expectations. In 1st and 2nd gear the ECU runs a softer map and here the R1 lugs a bit (for a superbike), feeling like an asthmatic 600cc. So treat it as such; spin the R1 up to 5-6000 RPM, set up for that newfound midrange punch, then slip the clutch, and rail off the line. One wonders if Yamaha’s plan is to make the R1 feel soft, cuddly and familiar to existing 600 and 750 owners, creating an easier transition to a bigger bike? That’s sort of like wrapping a keg of TNT in a teddy bear… then lighting a fuse. New buyers are in for a shock as, hugging their user-friendly R1, they find their way into the meaty mid-range and through to an explosive top end. Regardless, what transitioning riders will find familiar is the 600cc inspired handling. The sun is out and despite the cool I’m repeatedly shooting the R1 though the twists. The response is amazing. The bike feels marginally heavier than a 600, but a dab of weight to the inner peg and a bit of push to the bars, and direction changes are near as quick. A reduction in the triple clamp’s fork offset (from 30mm to 25mm) has made turn-in more responsive than previous generations but definitely requires the stock steering damper to calm the flightier tendencies that steeper angle has introduced. Here in the turns the YCC-T shows its brilliance, taking up twitches and inconsistencies in my inputs and smoothing the throttle control out. It goads me towards cold tired fate, picking up pace through the twists until the doom-o-meter is reading impending. I’ll not scrub the chicken-strips away past a 1/2-inch in these temperatures, but with each pass I’m pushing harder. 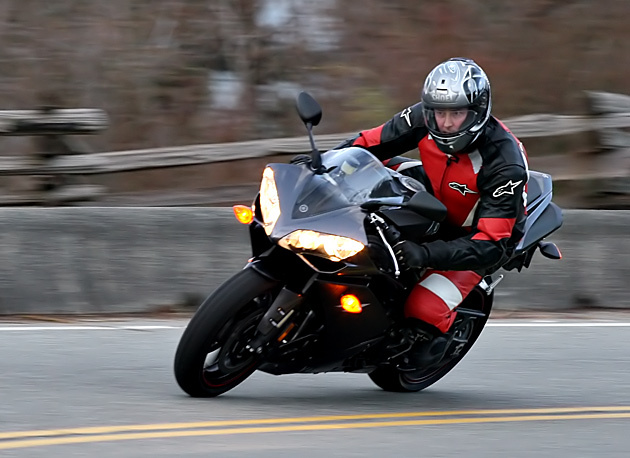 The R1 feels so very natural and well balanced here, carrying the speed easily. I’m setting corner entry speeds based on the conditions rather than the bikes’ feel – the R1 tells me 90kph into a 30kph marked is just right, common sense says otherwise. Rolling off the throttle, the R1 burbles contentedly, as if finally having found its purpose. A slight pull of the front brake is sublime; easy, linear, progressive and an utterly predictable feel. Coming from a ’06 GSX-R 1000 you’d be forgiven for mistaking a lack of initial bite for decreased braking power, but you’d be wrong. The 310mm disks may be 10mm down from last year’s R1, reducing rotating mass to improve turn-in, but those missing millimeters haven’t hurt stopping performance. That’s thanks to six-piston radial-mount calipers and a Brembo radial-pump front master cylinder. That said, I’m not grabbing a fist full of lever in panic stops – the Pirelli Diablo Corsas are a bit snaky in the cold. Through it all the R1’s taunt suspension and chassis provides a torrent of feedback conveying the exact interaction between tires and road. Yamaha’s “tuned-flex” chassis striving to give the rider better feedback, and it seems to work. You know the moment the warmish Corsas start to squirm and side-slip. It should be unnerving but it isn’t; again the YCC-T is smoothing my inputs making me a better rider than I am. Then we power out of the corners feeling planted, stable and confident. Tuning the suspension for my weight and the conditions helped that composure. Stock settings had the rear suspension hunkering down under heavy throttle, an increase in rear preload was in order while additional high-speed compression damping helped the rear hook-up in the corners. Up front the 43mm KYB forks benefited from additional preload and reduction in rebound. Pre-load was less than I’d use for aggressive warm weather riding, but the slight adjustment left the R1 more willing to hook up. Back out on “photo shoot” corner, I’m getting a kick out burning off speed by dumping a couple gears and letting the slipper clutch match the engine speed to that of the tires without upset or chatter. The R1’s slipper feels more natural under engine braking than 2006’s GSX-R 1000, and in a group ride you don’t get the feeling of the R1 overrunning those ahead of you when they ease off the throttle. The transmission itself is unobtrusive and natural; sliding through the ratios slick and positive. The one mar is a clunking drop from neutral into first. Realistically, you’re lucky to hit second in town, and between a heavy throttle, the YCC-T, and the low speed ECU map, first gear is quite usable. It’s all been so good that I’ve almost forgotten to investigate the lag. Have you ever tried to hold a consistent 5,500RPM through a corner? A rider’s natural inclination is to work the throttle, into, through and out of a corner. The lag exists, but it takes special unnatural effort to see it while cornering. Yamaha’s been candid with us regarding the issue, “The lag is due to interaction between YCC-T (throttle system), YCC-I (intake system) and the FI map. If the engine is not held at 5500rpm, the lag is not displayed (as when accelerating through that rpm point). It must be held at that rpm for a few moments to discover it. It is not alleviated by ‘power commander’ or other tuning.” In other words save your dollars looking for aftermarket solutions, and just ride it like a 1000cc. This aspect of the R1’s multiple personality disorder is here to stay; besides there are bigger fish to fry… literally. In the crawl of Lion’s Gate bridge traffic, the temperature reading on the dash flicks to 105C and the fan fires up pushing air across the more exposed engine and pulling it through the concave radiator. I’m hard pressed to imagine a summer ride on the R1 in traffic; it’s 7C/44.6F and I’m toasting even without heated grips or vest! h charcoal and black loaner as one would a sculpture. Trot out the “beauty is in the eye of the beholder” caveat, but there is hardly a bad angle on the R1. Okay, the under-headlight “ram air” intakes interrupt the sultry flow of the “cat eyes” and the signals front and tail could be better integrated. But these minor points are countered by many fine details; sharp red pin-striping on the wheels, plastic frame protectors, a slider protecting the clutch cable, textured tank plastics for grip, nightclub neon blue backlighting illuminating the chrome bezel of the revised tach, the cleanly laid out gauges, and headlights that make the blind squint. Better, it’s all executed with excellent build quality. After a long 220km test day of I’ll admit the ergonomics aren’t speaking to my 6″2′ frame. I’m soft after a riding-dormant winter, but the wisp of seat combined with the weight on my wrists and constant feedback has me thinking physiotherapy. In traffic I’m finding the cable actuated clutch is heavy… not Ducati heavy but it has something to aim for. Out on the highways the windscreen is so low and steeply raked that its extra 10mm height offers little protection, instead providing a clean and quiet airflow. I’ve abandoned using the mirrors for shoulder checking already knowing my elbows are along for the ride. Accessing other information, such as the two trip computers or odometer, from the dash is near impossible; cable routing blocks your reach and the “select” button is too small for gloved hands to use. So, this is still a sportbike then. 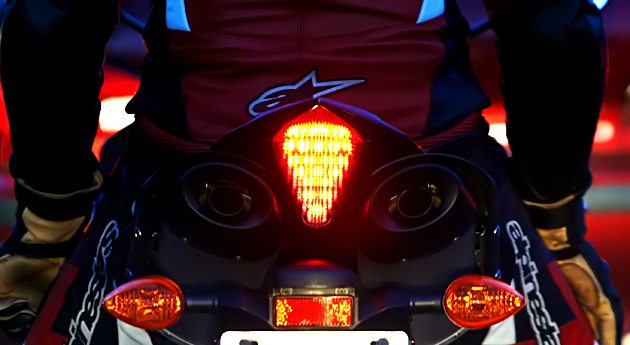 The GSX-R 750 rider and I have just cleared traffic. He pulls away and in litre bike spirit I let him have a sizable lead. Pulling the throttle open, the R1 hunches on its rear and near instantaneously we’re from 85kph to 145kph with the front dancing and my eyes wide open. It’s good to know that despite all the technology, all the softening at the lower end, and an ECU that gives the R1 multiple personalities, when you get down to it and ride the R1 like a superbike that’s exactly what it is… An exceptionally easy to ride, spectacularly fast litre bike, that still manages to be usable and approachable. That’s quite a package, kind of like hiding a keg of TNT in a teddy-bear. * The YCC-T controls the butterfly valves in the throttle bodies via an electric motor, rather than by a direct cable connection (though there is a manual backup for closing the throttle). This has the aim of improving response and throttle control. In addition the YCC-T also controls intake air volume for smoother torque development. YCC-T features 3 – ECUs inside the main ECU controlling ignition, fuel injection and the YCC-I.